Let’s face it, even the name “post-mortem” makes the process sound like a funeral. It’s not exactly something your team looks forward to. Chances are your team is exhausted by the end of a project and wants nothing more than to hit happy hour and not think about work. With post-mortems being a mechanism to capture learnings, report performance, and document institutional knowledge, it’s an odd juxtaposition of having a critical activity take place at a time when team energy and excitement is at its lowest. A good analogy is taking a long monotonous road trip. The first thing you want to do when you get to your destination is get out of the heck out of the car. You’re sore, tired, hungry, and probably need a shower. Now imagine now that you have to wait another hour before your door unlocks… welcome to the post mortem. Like road trips, there are things you can do during projects that make post-mortems more efficient and less cumbersome on your team. Keep in mind that while the destination is the end goal, there is plenty of time to capture insight along the way. As mentioned above, asking your team to reflect back on a project after it has been completed can be daunting. They want to think about anything besides what they just did. In order to counteract this mental fatigue at the end of projects, you should schedule pit stops along the way. Planning 2-3 scheduled times during the course of a project helps keep insight fresh and accurate. Pit stops don’t necessarily have to be meetings or lengthy either. You can make simple requests to your team like; What are hurdles you are currently facing? Share important assets you are working on. Have you learned anything during this project? Rate how well this project is going. We can’t stress enough how boring the word “post mortem” is. If you want buy in from your team, let them use different file formats and mediums to give you feedback in your pit stops. 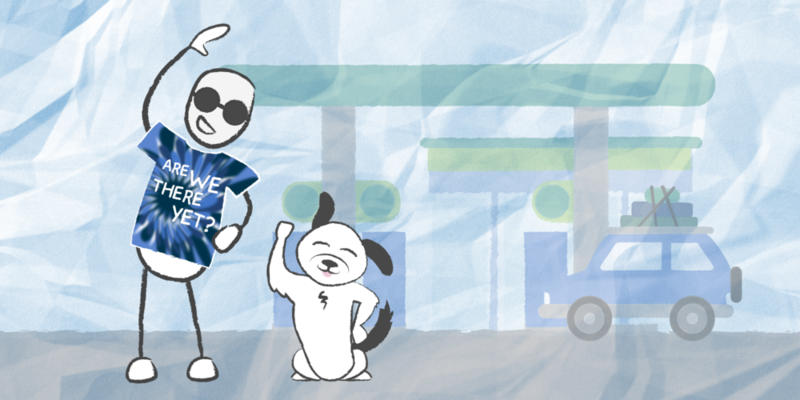 Pit stops aren’t just a time to get out and fill up on gas, they’re a time to shake out your limbs, do odd calisthenics you would never do in real life, and load up for a serious sugar binge. As such, Memes, GIFs, Youtube videos, let them all be free game. If you confine your team to just text you’re going to get dry responses without a lot of effort. Encourage your team to use alternative formats for responses and you’ll probably get more buy in and honesty. Are we there yet!? Let your team know where they are at during the project lifecycle. Zooming out at a high-level from time to time lets your team pause and reflect on what they are working toward. Show them what they have accomplished and where they are going next. It can help team members remember markers on their journey and add insight in the next pit stop or at the end of a post mortem when you cross the finish line. You don’t need to get fancy here, no need for an elaborate Gantt chart… a simple timeline drawing or whiteboard sketch with milestones is all you need. It might be helpful to also do this after a project is done and show your team what they accomplished. Make crossing the finish line a special moment, not a drag. You might not incorporate all three of these tactics for your post-mortem, but you should definitely give one of them a try on your next project and see how your team responds. Honestly, starting with funking it up and letting your team express themselves is the best way to get your feet wet and rejuvenate a process that is collecting dust. It could be as simple as keeping your current method but asking your team to include a GIF with their responses. 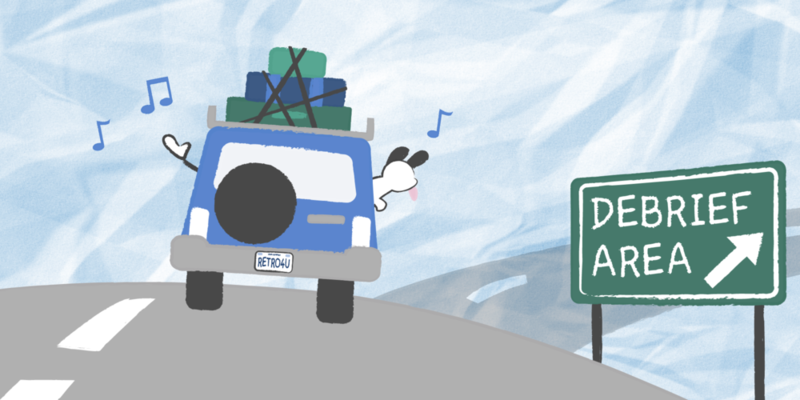 Whatever you decide to do, safe travels on your road trip… you can always come back to this article if you get a flat. Want to run effortless post-mortems or retrospectives? We are currently building a tool for you! Join our waitlist to beta test it. Thank you! We will let you know when our beta is ready for you to explore. Dec 10 Is There a Better Way to Do a Quarterly Business Review?